People who follow my posts know that I have a particular fondness for novellas. While I love full-length books that I leisurely read over a period of several days, there are times when I need that quick beginning-to-end satisfaction that a novella offers. Set that novella in the historic American West, with resilient heroines, tough but tender heroes, a dash of humor, a hint of danger, and a happy-ever-after and you have made me one very delighted reader. 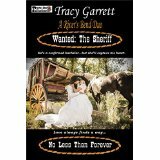 In the following three novellas, that's exactly what Tracy Garrett has accomplished. Instead of the joyous reunion she had been anticipating, school teacher Maryland (Mary) Henry arrives in River's Bend to collect her three orphaned nieces after their parents are killed when outlaws attack their wagon train. She plans a quick trip; meet her nieces, gather their belongings, then return with them to the town where she has been living and teaching since her cad of a fiance abandoned her at the altar. When circumstances change, Mary finds herself dependent on the mercy of the citizens of River's Bend and, in particular, former U.S. Marshal Jericho Hawken, the man who rescued her nieces...the man Mary holds responsible for the deaths of their parents. Mary isn't the only one who holds Jericho responsible for the wagon train deaths. Hired as extra security, it was Jericho's job to keep those people safe and the fact that he didn't haunts him. He's determined to do whatever he can to help Mary and her nieces, girls he came to know well during their time on the trail, and equally determined to track down and bring to justice the outlaw who robbed them of their parents. As Mary and the girls settle into life in River's Bend, in the home Jericho has opened to them, Mary slowly comes to know the inner man and her initial feelings about him begin to soften, clearing the way for other, deeper feelings to appear. And Jericho, who had despaired of ever being blessed with the family for which he yearns, begins to hope that, with Mary and the girls, that dream may finally come to be. But danger lurks and only when a murderer is finally brought to justice will this family be free. Only one question remains: will the Marshal rescue the fair maidens or will they rescue him? Dr. Franz Bittner has many friends in River's Bend. While not a native of the small town, the German immigrant is respected and well liked. He enjoys his work and the home he shares with his sister. He's never really felt the need for more...until the night when the body of a young woman, beaten within an inch of her life, is found in the river. Rebekah Snow Redmann may have been born into a prominent family back East but her life of privilege came to an abrupt end when her father, a well-known judge, gave her to a terrible man as payment for gambling debts. Her life since then has been filled with pain and abuse. She knows she has no rights under the law. If she's found, she'll be forced to return to the husband who tried to kill her but she would rather die than go back, especially after experiencing the gentle care and friendship of Dr. Bittner. As her body slowly heals and her friendship with Franz deepens, they both dream of a life together but a would-be killer - who happens to be her husband - stands between them. In the end, it will take trust, courage and faith in their feelings for one another to win the day. Sheriff Matthew Tate left his wealthy Boston family behind and has made a good life for himself in the small Missouri town of River's Bend. The confirmed bachelor has a nice home, all the creature comforts his wealth can buy, and none of the matchmaking mamas of Boston society. He enjoys his job and the company of friends, often sharing meals with Franz Bittner and his sister, Martha - a good friend who creates magic in the kitchen. Even though his good friend, Jericho recently fell in love and married, Matt doesn't feel there is anything lacking in his life. A determined woman is about to change that. Martha Bittner is twenty-seven, single, and her brother's cook, housekeeper, and medical assistant. She is also in love with Sheriff Matthew Tate and has been since moving to River's Bend four years ago. She's not getting any younger. With the town's first annual spring dance on the horizon, the time has come to take a stand and show the Sheriff exactly what he's missing. I so enjoyed watching the courting dance between Matt and Martha, especially how Martha blossoms once her course is set and Matt's vulnerability when it came to Martha's feelings for him. Then there's this: "His library was comfortably sized with bookshelves on two walls, from floor to high plastered ceiling. Arranged on them was every book he'd ever purchased or been given in his life. Books were his first love. He couldn't imagine parting with a single one." How could I not fall in love with this book-loving, peace-keeping hero? I've enjoyed my visits to Tracy Garrett's town of River's Bend where sweet love flourishes as hardy souls build new lives for themselves amidst the frequent life and death struggles of life on the frontier. I'm hopeful that she will take readers back there in the future. A certain missing sister has a story I want to read! Mine also. I love these kind of reads. Thank you for the post. I'm looking forward to reading these books. Tracy is a regular on another blog I follow, Petticoats and Pistols. I have read a few of her stories and have more I am trying to get to. Like you, I enjoy novellas and keep several shelves of anthologies. Life can be crazy and often there is only time for a quick short read. I am now adding more to my kindle, and Tracy's will be among them. Thank you, PJ. I'm thrilled that you enjoyed my River's Bend stories. I'm having a great time creating this town. Hi, Tracy. See you at the Junction.